Paper Bag Lanterns from Landee See, Landee Do. 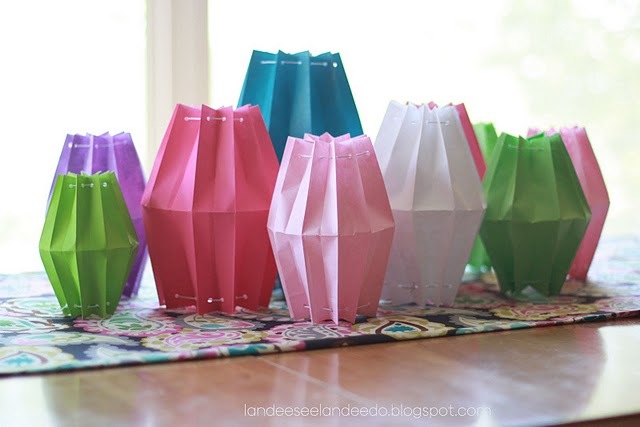 These fun colorful lanterns were created with inexpensive colored paper bags and this fun tutorial from Landee See Landee Do that she shared over at Lolly Jane Boutique. These would be so fun in red, white, and blue for your Memorial Day picnic table. Just make sure to use battery powered tea lights. You can check out the tutorial on how to make these paper lanterns HERE.